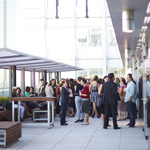 On a bi-monthly basis, WIMWA partners with an industry sponsor to provide a networking event. These events benefit women in mining and resources in a number of ways: they provide new contacts; stimulate ideas; build confidence and enable opportunities for networking. Feedback indicates that participants are greatly inspired by the shared experience of speakers, to develop qualities such as resilience and perseverance, helping them meet challenges on the level of personal development as well as that of career. Any positive outcomes or progress achieved in this way is not aimed exclusively at women; rather it is considered beneficial to the industry as a whole. These networking events are produced with the objective of being informal. They tend to be lively and entertaining as well as informative, and are largely non-technical to ensure a broad and inclusive appeal. Participants have come from many walks of life and have included lab assistants, geologists, truck drivers, lawyers, engineers, geophysicists and HR professionals. Events have ranged from a high tea event in the Pilbara to an Indigenous art exhibition, but most often take the forms of a sundowner incorporating a longer presentation or a brief presentation accompanying breakfast.